What is the difference between DaaS and VDI? The familiar concept of VDI comes in to the mind while introducing DaaS to the readers. The core difference is that VDI is an on-premises infrastructure. In this system, the virtual desktops are interrelated to servers within the organization. On the other hand, DaaS is hosted outside the organization. They are hosted in the Cloud by service providers. 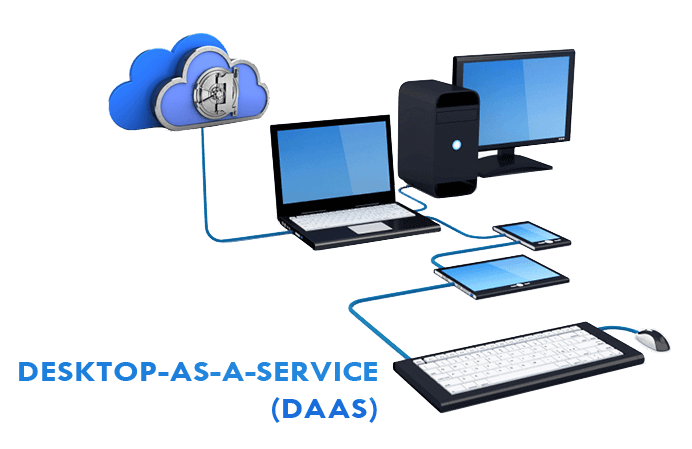 DaaS is low cost and more flexible. Pricing and subscription model play a great role in companied preferring to switch to DaaS than a VDI. A virtual Desktop hosted in the cloud is available for longer hours, uses low power and consumes less hard disk space. Hence the overall costs are cut down by up to 60%. Flexibly: DaaS environment is flexible. For Windows users, desktops are offered in Windows, for Linux users, desktop service is offered in Linux. The two environments can be switched between too. Disaster Recovery: DaaS is not a DR solution, but it can help employees continue work after a Disaster much faster. Security: with DaaS, viruses and other security compromising factors affect the working environment. Resources: DaaS requires a high internet connection speed. So, employees should have good internet resources whenever they are accessing the device form the cloud. Single Point of Failure: Well, that’s costly, not in terms of money but in terms of time. If the providers go down, employees of companies who have consumed DaaS form the provider will be left to waiting for the Provider to get back up again so they can resume their work. Good providers take measures for Disaster Recovery, though. MachPanel is a globally trusted Cloud Business Automation Solution Control Panel. It provides Cloud Service Providers to automate their business, deploy turnkey solutions, Manage SharePoint Services and many other services without much hassle. This control Panel provides everything needed to manage entire Lifecycle of end-to-end Service Delivery. There are self-service tools present for Provider, Resellers, Customers and Active Directory Users. User friendly reporting and overall comfortable user experience makes MachPanel a popular Control Panel in the market. Get started with MachPanel today for better business automation and management of your cloud services. This entry was posted on Wednesday, December 5th, 2018 at 2:39 pm	and is filed under Cloud. You can follow any responses to this entry through the RSS 2.0 feed. Both comments and pings are currently closed.